New York native Cristina Orbé didn’t start playing music until 2000 – which is astonishing because her music is already undeniably poignant. 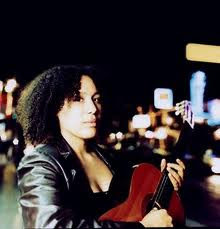 The first time I heard Orbe’s music I was sitting around web-surfing when I stumbled on a track entitled “When We Walk” from her 2003 debut album Sway. As I listened to more of Orbe’s music I couldn’t help but be drawn in by the subtle vibrations of her acoustic guitar and her alluring voice. Orbe’s songs have a powerful sense of melody and social voice but at the same time have a curious disarming quality – one that allows the listener to be taken in by Orbe’s sharp lyrics while remaining absorbed by the overall dynamic of the simply composed music. Because of her intensely personal tone it doesn’t take long to feel like you know Cristina. Within the span of just a few tracks you can come full circle, identifying with Orbe as if you are close friends. CLJ: Tell me a little about your musical background? Cristina Orbé: I didn't play music until 2000, period. In a move to Seattle that was pretty much based on voices in my head, I found my singing voice, talent for melody, rhythm and songwriting. Then, just like a half formed fawn, I stumbled around playing as much as I could and not knowing how crazy I sounded. By 2001, I was in my first band where I learned a lot about music, bands and people. I have always been blessed with the luck to attract and play with incredible musicians no matter where I sat in the hierarchy. Just this year we broke up and I've been touring regularly playing my solo material. Its been amazing. CLJ: In 2003 your debut album Sway was released. Can you tell me a little about the album? Orbé: The album was pretty much a fluke. Initially I planned on recording my most recent songs to copyrite and then I told my friends what I was doing and they all wanted copies. So then quickly at the end it became a record. I was blessed to have Dave and Alethea from the Beehive recorded it in their home studio for very little money. We did maybe 3 takes a song and then I did a day of harmonies and brought in a cellist. Super informal and random. People still tell me they love that album. CLJ: Yeah, I'm one of the people that love that record. How likely is it that with a larger budget you'd be making music that’s much different than the stuff we find on Sway? Orbé: With a budget I could bring in producers and other players that would definitely affect the way my music is presented. It'd be a whole other game - potential for a lot of fun. CLJ: Is there a particular theme that is common in your writing? CLJ: So, In your opinion what makes a song good? Orbé: When a great song is played you can't do anything but listen to it. If you're lucky it breaks your heart or makes you scream at the top of yours lungs in a bloody rage. Good songs are alive. They transform throughout time. Its like they capture a piece of undeniable truth woven into sound. CLJ: Can you describe your creative process when it comes to writing music? Orbé: Its changed throughout time and still will surprise me. For the most part, I find some chords that hypnotize me and then play with melodies until one electrocutes me and then I draw out the rest of the melodic photograph. Sounds become words and I find words that tell a story. Its completely based on instincts. CLJ: So you have a subject in mind and look to write the music that would fit that subject? Orbé: Not really. Its way less structured than that. Usually the topic finds me - its better that way. CLJ: You've drawn comparisons to artists like Tracy Chapman and Fiona Apple. How do you feel about that? Orbé: I don't know that its entirely accurate. I love them both as artists but I don't know what they are comparing. CLJ: Who or what are your major influences? Orbé: B#, A7, Bm, David Bowie, F#, major and minor 7th's, Nina, G#, Bell Hooks, Radiohead, Zizek, concretization, materialites, unicorns. CLJ: Is music your only endeavor into the world of art? Orbé: I have also been known to curate a show or two. I teach rock school to high school youth in Seattle when I am in town. Costuming..myself. I am working on a shadow puppet show with another artist. CLJ: Can you tell me a little about where you’re from, what type of atmosphere you were raised in? Orbé: I was born in New York City. At around 9 months my family moved to Clarks Green/Summit, PA (just outside Scranton). From that point on we moved fairly regularly from one white suburban prison to another (West Windsor, NJ and Alpharetta, GA). My parents grew up poor and never wanted to live that way again. They raised us with education being the most important value in the house which didn't leave much room for cool clothes and electronics. In Pennsylvania, I am pretty safe saying we were the only brown/black kids with whom these white people had had human contact. Racism abound, it was not easy. We were always being watched by our neighbors and held up to ridiculous standards. Its funny how people of the privileged class will constantly nonchalantly mispronounce and ask you to explain your name, where you are from, why you exist as if you were never meant to survive the social experiment of America and then paw at you as if you are not human but a puppy or a doll. I felt isolated, objectified and invisible pretty much in all the places we ended up living. I would describe my adolescence as a black unicorn concentration zoo. Ok... maybe not as miserable as that sounds but those circumstances had a substantial effect on me and shaped a great deal of my perspective. We were unwittingly part of the desegregation of the suburbs. CLJ: Did you find Seattle's atmosphere to be much different than what you were accustomed to experiencing in the East? Orbé: Yes and no. So many factors were different when I moved to Seattle. I was an adult. It was my first major decision as an adult to move here. I had a great deal of control over my experience. Here I was able to find a community of amazing brown/black people who had grown up similarly. That helped me to heal. Most everything changed in my life because I gathered a lot of tools and support that helped me deal with this crazy place called America. I am no longer silent about the subversive violence that eeks its way out of us in words, beliefs and actions. I also had a spiritual awakening that changed my entire life. CL: As of now can you make a full-time living as a singer-songwriter or do you have to diversify a bit? Orbé: I mix it up. When I am not performing I teach singing and songwriting to youth. I also work for a cultural arts center in an amazing situation that allows me to do pretty much what I am passionate about within a flexible schedule. And then there are the random calls for voice over work, live narration, curating panel presentations etc – you name it. I am very fortunate to have a constant flow of interesting work. CLJ: What’s in the works now? CLJ: Thanks for talking with CommonLine. We'll look forward to talking music with you again in the future. Cristina Orbe's music can be found in various places and is available for sale and download at CDBaby and Amazon. Tour dates and more are available at: www.cristinaorbe.com and www.myspace.com/cristina. Performances by Orbe are also available on Youtube.